Roll the Dice on Mandarin Palace! Mandarin Palace is a casino site full of Eastern Charm, with Chinese Lanterns promising good fortune. The casino welcomes players from around the world including the US, and is part of an international gaming group who use the BetOnSoft casino suite. In this review of Mandarin Palace Casino first up you can find a quick overview of the company. Next the Craps game is covered, starting with the look and feel of the software before going into the features and payoffs. The bonuses and loyalty program is looked at next before finishing off by going into the site’s banking options and customer support. Mandarin Palace was established in 2009 and is licensed and regulated by Curacao, Netherlands Antilles. It is owned by the Genesys Technology Group which has offices worldwide and own other casinos including the Grand Eagle Casino and Treasure Mile. While Mandarin Palace has a strong Asian theme it is clearly targeted at the western market with games only available in English, German, Italian and French. Banking is available in a wide choice of currencies although again no Eastern currencies feature. 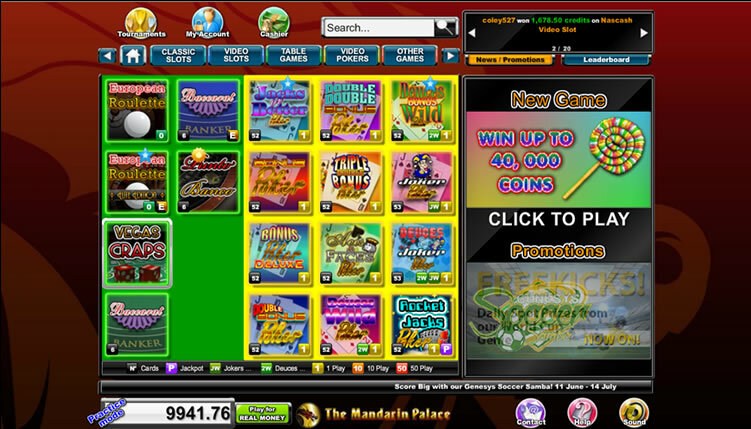 The site employs the award winning BetOnSoft software to power its casino. 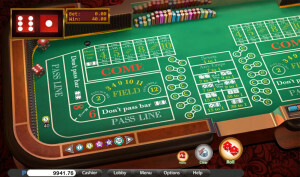 The BetOnSoft software provides Mandarin Palace customers with a flash client to play on your web browser or via your mobile device, although the Craps game is only on the downloadable client available to both Mac and PC users. 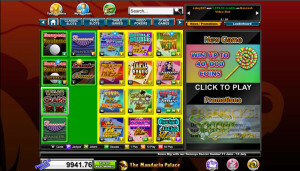 Mandarin Palace offers a Vegas Craps game which can be found either through filtering down the tabs or using the search feature which is handy with such a crowded lobby. Once you get on the table the interface is really clear and easy to find your way around. The areas you can bet are highlighted as you move across them and popups show the maximum bets you can place and the pay offs you will receive. Mandarin Palace supports a 3-4-5 odds structure, which is a refreshing change from the normal 3x or 2x options you normally have in online casinos. It also means you can further maximize the only bet on the table which offers no house edge. If you wish to bet the field this is paid out at even money apart from 2’s which pay double odds and 12s which pay 3:1. While the game is great when it works while testing it I did find software to be a bit buggy and difficult to load up at times. Mandarin Palace offers a $4,500 sign up offer split into several smaller bonuses. These require a 40x play-through and the terms are quiet detailed with several restrictions. Craps unfortunately is ineligible for any of these bonuses, although if you enjoy playing other games you would be wise to check the terms and conditions first. Craps players can benefit from the Loyalty program which you are automatically enrolled on. Every time you place a wager at Mandarin Palace you accumulate loyalty points which can then be traded for prizes or cash. The more points you gain the higher your VIP level becomes, unlocking greater value rewards. You can find many games on Mandarin Palace including numerous slots and a large variety of table games. There are plenty of game variations available too, with different types of Blackjack and Keno games along with many progressive jackpots. There are many payment options you can use at Mandarin Palace which are all detailed on the Banking page of the website. Particularly for US players there is helpful advice to ease deposits and details on withdrawal methods including amounts permitted and time spans expected. Credit and debit cards are a popular and easy option which can be used by all customers and those in Canada and Europe have a wide range of other options including e-wallets such as Skrill. Withdrawals can usually be paid back via the method you deposited with, although particularly for US players this may involve a charge. If you have any issues with this or anything else on the site Mandarin Palace customer support is available 24/7 via email, live chat or a US toll free telephone number. Mandarin Palace’s Craps game, powered by BetOnSoft plays well and offers good value for online players. While Mandarin Palace’s lobby feels a bit crowded, the Craps table is presented very clearly and is easy to find your way around. The software can be a bit stubborn when it comes to loading up although once its running it behaves fine. While Craps players cannot take advantage of the sign up bonus there is a loyalty program they can take part in which offers some reward for their play. Meanwhile the large choice of deposit and withdrawal methods should find an option to suit most players. Good range of banking options. Some small annoyances with load times.